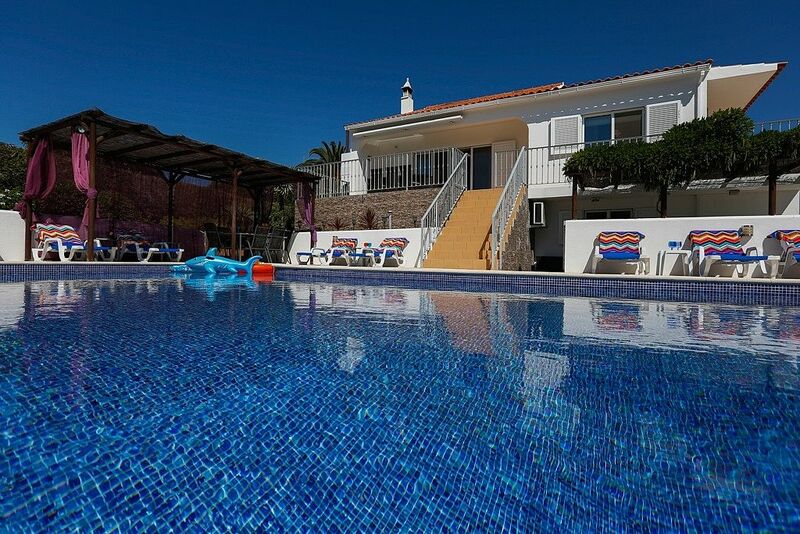 Magnificent luxury villa with an additional separate cottage Guia, Albufeira. - Peaceful central location set amongst vineyards yet only a 10 minute walk from the Town of Guia. Os Pinheiros is the epitome of chic style and modern living. The traditional architecture blends perfectly with the white walls and richly coloured furnishings. This style continues outside to the beautiful gardens and modern pool area with the outdoor furnishings equally in keeping with the quality of the interior. The villa itself can accommodate up to 8 people. There are 3 bedrooms on the ground floor and a quality sofa bedroom on the mezzanine floor. There is a separate one bedroom guest cottage within the grounds which mirrors the quality and furnishings of the main villa and accommodates up to 4 people. If you book the main villa only the cottage will not be rented giving you sole use of the pool and gardens. Os Pinheiros is a very rare property not usually available for rental and as well as being suitable for the most discerning of clients makes a perfect retreat for a large family or group of friends for that special celebration or just an indulgent holiday. Situated approximately a 10-15 minute walk from the town of Guia, 4kms from the beach and 3kms from Algarve Shopping complex and Zoomarine. The front entrance opens onto a stylish hallway which leads through an archway into the large lounge where there is a comfortable contemporary L shaped leather sofa to relax on or watch the flat LCD widescreen TV with digital satellite receiver UK TV channels and DVD. This is the heart of the home from which all the other rooms lead. The lounge leads directly onto the patio area extending the living space outdoors and allowing you to enjoy outdoor dining and fabulous views of the countryside. This terrace overlooks the large pool and barbecue area close to the main alfresco dining area. From the lounge area a glass framed staircase leads to the mezzanine floor. This is a peaceful seated area with a library and working area with computer desk and full WiFi internet connection. There is a double sofa bed which is ideal for teenagers. The dining kitchen area is accessed through an archway from the main lounge on the ground floor. The kitchen is fully equipped with cooker, hob, microwave, washing machine, dishwasher, and fridge/freezer. It offers everything from preparing a snack to a formal dinner for a group of friends. Budding cooks will adore the variety of kitchen utensils and accessories. There is a large dining table which can seat 12. The master bedroom is a large, light room with an en suite shower room adjacent. The bed is super king size. From the bedroom window you can enjoy the magnificent views of the surrounding vines. The garden bedroom fills with natural light and has stunning views of the vines and surrounding countryside. The beds can be twin or king. A modern bathroom is adjacent. To the front is a stylish double bedroom with views of the surrounding gardens and a separate modern shower room adjacent. All 3 bedrooms have fitted wardrobes and hairdryers. The mezzanine room can be changed into a 4th bedroom. The quality sofa bed is a comfortable double bed. There is a chest of drawers and a wardrobe for clothes. Curtains can be drawn across the mezzanine for total privacy. All 3 bathrooms within the villa are finished to the highest standards with modern fittings and walk in showers. The main bathroom has a large sumptuous bath in which to relax. One bathroom is en suite; the other 2 are adjacent to each bedroom which provides each bedroom with its own bathroom. There is a WC in the games room. Directly below the living space is a large indoor games room with tv area, equipped to the very highest of standards including a sound system, DVD, LCD TV with full Sky package including sports, movies and Sky planner. The games room boasts a built in bar which is equipped with fridge, ice machine and sink. There is a toilet and washroom adjacent. The games room comes complete with a fabulous pool table which will provide endless hours of fun. The games room opens out to the BBQ and alfresco dining area. Os Pinheiros cottage consists of an open plan kitchen which is fully equipped with oven/hob, fridge small freezer and washing machine. There is also a microwave, coffee maker, kettle, toaster and ironing facilities. The living area is stylishly furnished and has a flat screen LCD TV with satellite package UK TV and DVD player. There is a quality leather sofa bed which can sleep 2 people. The large bedroom is stylishly furnished and can be arranged to accommodate king size or twin sleeping arrangements. Patio doors from the bedroom lead out to the immaculate gardens. There is a spacious en suite with walk in shower. The cottage has a private covered terrace area with quality furnishings and leads directly onto the magnificent garden area. Os Pinheiros villa and cottage are set amongst their own private gardens and surrounded by mature hedging. Access to the property is through electrically operated gates which open onto the cobbled driveway. The entry system is equipped with a security camera. The magnificent gardens have meandering pathways through the lawns and plenty of mature palms and fruit trees. Within the gardens there is a covered pergola furnished with comfortable seating. The gardens are fully illuminated at night. The large swimming pool at Os Pinheiros is 10.5m x 5.5m with a depth of 0.9m to 1.9m and can be heated in the winter to provide the perfect place to soak up the hot sun. The swimming pool area is surrounded by a child safe wall and is accessed through lockable gates. The outdoor furnishings are equally in keeping with the quality of the interior. Within the pool area there are plenty of sun beds and outdoor seating. There is a shower area adjacent to the pool. Pool towels and robes are provided. The quality theme continues to the outdoor dining/BBQ area with a covered seating area for up to 12 people. From the mezzanine a door leads onto a furnished sun terrace. The terrace itself has magnificent views of the local countryside with distant sea views. This space provides a peaceful retreat for adults to enjoy late evening cocktails whilst watching the sunset over the Monchique Mountains. We have an English speaking villa manager called Carol who can help you with your stay. Carol can make arrangements if you need to see a doctor, dentist, physiotherapist, lawyer, police, British Consulate etc. We also have an excellent pharmacy in Guia who give advice and treatment for minor ailments. There is a doctors clinic in the Algarve shopping mall. It important to remember, especially when travelling with children, to take a few minutes to familiarise yourself and your party with the pool area on arrival. Children must always be accompanied by an adult in the pool area. On arrival the villa manager will demonstrate the operation of the pool cover. Guests are requested to abide by all safety instructions when operating the swimming pool cover. All doors, shutters and windows lock securely; internal door keys can also be requested. The villas have safes for valuables in every bedroom. Although not specially adapted wheelchair accessibility is good. From the front door into the villa there is a single step. Once inside the villa the 3 bedrooms/bathrooms and kitchen are on the one level and the large lounge leads out to the upper terrace. There are 11 steps from the upper terrace to the pool area. These steps can be avoided by accessing the pool and BBQ area via the driveway. The cottage itself in on one level, again accessed via the driveway. Pool heating costs £240 per week, £400 per week 1st November- 30th April. Complimentary solar pool heating July and August. Thank you for considering our villas. The villas are family owned, we are a mixture of honest retired and working professionals living in Scotland, Ireland and the Middle East. We have spent many holidays in Guia for the past 25 years. The location is perfect for us to meet as a family as it is only 30 minutes drive from Faro Airport. We love the peacefulness of both Villa Os Pinheiros, which is set amongst the vines and Villa Aguas, which is set within the quiet residential location of Quinta dos Alamos. We undertook the serious task of renovating Villa Os Pinheiros followed by Villa Aguas and have created beautiful comfortable homes. We believe that whatever is worth doing at all, is worth doing well. We can arrange a FaceTime call with myself or the villa manager. We love the variety of good value restaurants in Guia and recommend the local small market for the daily fish, fruit and vegetables. The beautiful beaches are 4 km away. With fantastic shopping and entertainment nearby, including Algarve Shopping and the Zoomarine wildlife and theme park the central location of Guia it perfect for all ages. The villa has been extensively remodelled to create a beautiful home that is both practical and comfortable. It has been furnished to an exceptionally high standard and will provide visitors with an oasis in the sun to unwind and enjoy the best of the Algarve. As a keen gardener we loved the established manicured private gardens which are surrounded by mature hedging. The magnificent gardens have meandering pathways through the lawns and plenty of mature palms and fruit trees. All 3 bathrooms within the villa are finished to the highest standards with modern fittings and have bedrooms adjacent. The main bathroom has a large sumptuous bath. The guest cottage has a large en-suite shower room. There is a WC in the games room. Careless use will be charged for. Oil radiators and a log fire with supply of wood provided. Good quality linen. Beds are changed weekly. Cot linen supplied. Pool towels, robes and bathroom towels are provided and changed regularly. The large lounge has a comfortable contemporary L shaped leather sofa to relax on or watch the flat LCD UK TV with digital satellite receiver and DVD. This lounge overlooks the large pool and patio with alfresco dining area. There is a fire for winter. The kitchen offers everything from preparing a snack to a formal dinner for a group of friends. Budding cooks will adore the variety of kitchen utensils and accessories. Good supply of DVD's are available. Good selection of books on the mezzanine. Games room with cinema area, equipped to the very highest of standards including a state of the art sound system, DVD, widescreen TV with full sky package including sports and movies. The games room comes complete with a fabulous pool table which will provide endless hours of fun. Children's pool inflatables are provided. The magnificent gardens have meandering pathways through the lawns and plenty of mature palms and fruit trees. Within the gardens there is a covered pergola furnished with comfortable seating. Available to rent at Gale beach. Available to rent in Guia. Boat rental and lots of boat trips are available locally from Albufeira Marina. The outdoor furnishings are equally in keeping with the quality of the interior. Tennis facilities are available locally. Please ask Carol the villa manager for details. Golf is the most popular participation sport for visitors to the Algarve. The game can be played all-year-round and most of the Algarve's 30+ courses, including some of the finest in Europe, are open to any player with a handicap certificate. It is a surprisingly well-established sport in Portugal. Take advantage if you can of discounts offered on multiple green fee tickets at certain courses. Several of the clubs are also tied into an economical 'passport' scheme offering reduced green fees. During the summer, cut-price green fees are available for midday and evening teeing off times at some courses.The nearest golf course from Os Pinheiros (Salgados) is 3km away. The swimming pool is 10.5m x 5.5m with a depth of 0.9m to 1.9m and can be heated. The swimming pool area is surrounded by a child safe wall and is accessed through lockable gates. Notes on accommodation: The villa has full wifi access. A complimentary welcome pack is provided. Children’s amenities are available on request at no extra cost: children's range of DVDs, inflatable toys for swimming pool, high chair, cots, steriliser, bottle warmer, changing mat and stair gate for the mezzanine. The swimming pool area is surrounded by a child safe wall and is accessed through lockable gates. Directly adjacent to the swimming pool area is a fabulous indoor games/TV room equipped to the very highest of standards including integrated sound system, widescreen TV with SKY TV and DVD player. The lounge and cottage have UK TV channels. There is a built in bar which is equipped with fridge, ice machine and sink. The bar is fully equipped with alfresco dining utensils and bbq accessories. There is a toilet and washroom adjacent. The games room comes complete with a fabulous pool table which will provide endless hours of fun and opens out to the BBQ and alfresco dining area. NON SMOKING property. The villa and cottage are set amongst their large private gardens and surrounded by mature hedging. Access to the property is through electrically operated gates which open onto the cobbled driveway. The magnificent gardens have meandering pathways through the lawns and plenty of mature palms and fruit trees. Within the gardens there is a covered pergola furnished with comfortable seating. This is an ideal place for an evening cocktail. The gardens are fully illuminated at night. The fabulous swimming pool is 10.5m x 5.5m with a depth of 0.9m to 1.9m and can be heated in the winter. The outdoor furnishings are equally in keeping with the quality of the interior. Within the pool area there is plenty of sun beds and outdoor seating. There is a shower area adjacent to the pool. The quality theme continues to the outdoor dining/BBQ area with a covered seating area for up to 12 people. The mezzanine floor in the villa leads onto a furnished sun terrace to enjoy late evening cocktails. Cleaning / Towels / Linen / Maid service: Good quality bedding, linen, towels, pool robes and pool towels are all provided and will be changed on a regular basis. A regular maid service is provided, frequent linen and towel change, details will be given on arrival. Other: From the lounge area a glass framed staircase leads to the mezzanine floor with sofa bed. The 1 bedroom cottage has an open plan kitchen /living area with sofa bed. There is a fabulous games room with bar/kitchen area, sky movies/sports and pool table. Just returned from an amazing week in sunny Algarve. Wall to wall sunshine, high temperatures, quality golf courses and fine dining in the huge variety of local restaurants was all topped off with our stay in the most fabulous luxury villa. Villa Os Pinheiros is situated in the heart of the Algarve surrounded by many quality golf courses and stunning sandy beaches. Our stay was made all the more perfect by the ease of booking our holiday and the arrangements and organisation of our golfing requirements. The villa itself is perfect for any kind of holiday whether that is lounging by the large heated swimming, visiting the wonderful sandy beaches on the doorstep or in our case a bespoke golfing holiday which was arranged in advance of us arriving in the Algarve. Our tee times were pre booked at our favourite golf courses, our transfers to and from the courses were sorted and evening meals booked in local restaurants. The whole experience was flawless and made our stay so enjoyable. The villa easily catered for the 8 adults in our party and was full of quality touches throughout. The 3 spacious bedrooms in the main villa are beautifully presented with quality furniture and fittings throughout. There is also a bed settee in the mezzanine area which provides comfort and privacy for extra guests. The lovely cottage at the bottom of the garden provides luxury accommodation for 4 adults and provides a quiet and tranquil living space in the wonderful gardens that surrounds the villa. Entry to the villa is through electric gates and the villa is surrounded but high hedging which provides ample privacy and security. The villa comes with quality Wi-fi and the amazing games room has a full Sky sports and movie package which along with the pool table, bar and fridge makes it a fun place to spend the evenings. The villa bedrooms have adjoining shower/bathrooms and the large dining kitchen made it a pleasure to spend some evenings in cooking the fresh local food and wine. The villa is situated only a short walk from the village of Guia which has numerous restaurants, cafes and bars to suit everybody. I would definitely give Villa Os Pinheiros a 10 out of 10 in all aspects and we will definitely be coming back as soon as we can book it! Thank you for the fabulous review, I am pleased that the villa was perfect for your golfing group, it is an excellent villa for a get together and I am pleased all of our hard work making it 5 star is appreciated. I have just returned from an amazing holiday with golfing friends. The villa is stunning, situated in the central Algarve which was perfect for our golfing days as the courses we chose to play at were all within a 30 minute drive from the villa. Villa Os Pinheiros is beautifully furnished and all the rooms are off the large social lounge. There were great spaces for everyone, the games room, mezzanine terrace for some quiet time and the dining table on the upper terrace was perfect for enjoying alfresco breakfasts and lunches. We ate out in Guia every night as the restaurants were of a good quality and very reasonable, around €15 per head with drinks. The opening of a new pizzeria was perfect for a takeaway. The weather was great for a winter holiday, the heated pool was perfect for this time of year and the views over the vines were stunning. I would recommend and return to Villa Os Pinheiros for a longer period. Immaculate, well maintained with a touch of luxury, you get what you pay for. Thank you again for the easy booking process and great communication throughout. Villa and cottage Os Pinheiros suited our family get together perfectly. Is is a large spacious villa with lots of private areas in the garden giving everyone their own space. I knew we had chosen a beautiful villa as we approached, the magnificent garden stood out. The villa is well maintained and home from home. Thank you for taking the time to share your holiday experience, it’s is great that you have booked for next year like most of our guests. Another magnificent family holiday at Villa OsPinheiros. Villa setting continues to impress and the care and attention provided by Villa Manager Carol, Pasha and Carlos is superb ensuring you can relax and enjoy your stay. The luxury and comfort experienced is second to none. The location of the villa is close to fantastic choice of restaurants with beaches a short drive away. OsPinheiros lives up to it's five star rating and is a special place to holiday. Thank you for sharing your holiday experience and returning year after year! Great success for 3 generation family. Everything beautifully maintained and well equipped. Carol the Villa Manager was wonderful. Excellent cleaning staff. Pool perfect for children of all ages, with lockable gate access giving peace of mind for parents, and even a chest of inflatables supplied for the children to play with. The one-bedroom cottage in the grounds gave peace of a different kind for us as grandparents. Immaculate gardens, most attractive vineyard surroundings, (a real treat not to be hemmed in by scores of other villas).Hire car necessary, but short car journeys to beaches, shopping, airport etc. We had a trouble-free and most enjoyable stay and hope to return. Thank you for taking time to review your holiday experience, we hope you will visit again. When we first arrived in Portugal we weren’t quite sure what to expect. I literally wept when I walked in and saw the view of the vines from the front door. It will exceed all your expectations as this villa is truly is incredible. You are transported to a place of utter luxury, Everything at this villa was perfect from the layout, to the amenities, to the accommodating Villa manager Carol who helped guide us with great suggestions of what to do and where to go. The location is AMAZING – right in central Algarve. We have now stayed here twice with family and friends, and plan to come back again and again as we still have not yet explored all of the local area. Thank you for taking the time to review our villa we look forward in welcoming you back. There are many riding centres on the Algarve with horses for adults and ponies for children. Those who have not been in a saddle for a while may want to take a few lessons before riding out over sand dunes or on trails through pine forests. Tennis is another very popular, year-round sport and there are a great many courts which can be hired at hourly rates, some of which offer coaching. Other sports with more limited facilities include archery, clay-pigeon shooting, lawn bowls, micro-light flying and squash. There are a few health and leisure clubs with good facilities for a number of sporting activities. The villa games room has sky movies and sports. Some of the best beaches the Algarve has to offer are only 5 mins away. As well as the lengthy Praia de Gale (stretching westwards towards Armacao de Pera) with its sports facilities snack bar and restaurants there are many secluded sandy coves with sculptured sandstone cliffs and azure sea. The choice and variety is extensive. For those who like more hustle and bustle Albufeira is less than 15 mins away with its famous marina, historic old town and even more beaches! Car hire is recommended but not essential. We can assist in all your transportation needs. Airports, beaches, nights out, tours etc without you having the worry of driving. Just ask and we will can arrange a private driver with people carrier for your holiday. Private transfer from Faro airport to Villa Os Pinheiros costs 50 euros for 8 people, 40 euros for 4 people. Os Pinheiros is only 10 -15 minute walk from the village of Guia which is located slightly inland forty minutes from Faro Airport and lies about 5 km from the magnificent beaches. It is only a few minutes drive from Algarve Shopping and Zoomarine. Guia is famous for its variety of good value restaurants. There is also the daily fish, fruit and vegetable market and local supermarket. Guia is located in the centre of the Algarve and is within easy reach of all other resorts and places of interest. To enjoy what this special place has to offer, you need to stay in a special villa, and that's what we have. Staying in Os Pinheiros is a wonderful experience. Set amongst the vine yards of Sir Cliff Richard you can spend hours relaxing by the pool and enjoy alfresco dining at the BBQ area. Os Pinheiros also provides great value for money. By dividing the cost by the number of people in your party it can be very economical compared to staying in a hotel. Guia is a village located slightly inland about forty minutes from Faro Airport and lies about 5 km from the magnificent beaches. It is only a few minutes drive from Algarve Shopping and Zoomarine. Guia is famous for its variety of good value restaurants. There is also the daily fish, fruit and vegetable market and local supermarket. Little extras like 24/7 access to our host are just some of the little things that make your stay with us more enjoyable. We also offer a generous welcome pack to help you get settled! We are very proud of what we offer guests and we believe that you will get excellent value for money. We really want you and all of our guests to have an enjoyable experience and our support team make every effort to have the property looking like new on change over days! We will have the property fully cleaned and ready for your arrival by 3pm on the day of your arrival and would ask you to vacate by 10am on the day of departure. Please ensure that you and your guests treat our property with the up most care and respect and leave it in just as good a condition as you received it. Air cooling and heating are included in the price however excessive and careless use will be charged for as this is metered. There are no hidden charges - all costs are covered in the rental price! Villa Os Pinheiros has been accredited with its tourism licence by the Albufeira Municipal Department of Tourism which assures that the villa complies with required standards of accommodation and safety.